Apartment developer Humberto Lopez confidently boasts his newest complex is “the nicest luxury project in Tucson.” At a cost of $35 million, the 13-acre project seems to defy financial logic during a weak economy. Multi-housing experts, however, insist these are good times for new Class A apartments. It makes such solid economic sense in fact, at least four other high-end rental projects are underway. “There are a number of factors in play, very few quality multi-housing properties have been built in the last 10 years. Much of what was built was student or low-income housing,” said Bob Kaplan, a principal with PICOR Commercial Real Estate. These underlying conditions are what convinced Lopez to build Riverside Crossing on the southeast corner of North La Cholla Boulevard and West River Road. The complex has 304 apartments in 14 buildings. Luxury rentals are doing well and Kap-lan expects to see more projects soon. The Class A apartment “has already made a nice comeback,” he said. A flurry of condo conversions just before the housing market slumped took a few thousand Class A and B units off the market. “That left a very short list of nice complexes. We’re trying to fill that gap,” Lopez said. His HSL Properties owns and operates more than 9,400 apartment units in 37 communities throughout the state and is the largest operating in Southern Arizona. Several Riverside Crossing features were borrowed from developments in Houston, Austin, Las Vegas, and Phoenix. Those amenities include energy-efficient construction, a gym, pool and movie theater. Interiors feature walk-in closets, granite countertops, coffee bar and wireless Internet. “The lobby is hotel-like and registration is through an iPad,” added Mireles. Riverside Crossing will offer units of one, two and three bedrooms. Monthly rents are projected to be $800 to $1,200. The lobby will be open this weekend to take pre-lease applications. Tentatively, it’s expected that tenants will be able to move in Nov. 1. 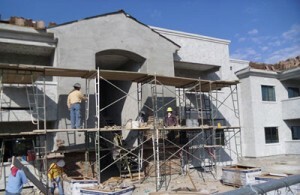 “We’re fortunate we were able to build while construction activity was slow. It may sound expensive, but this area is where people can live, work and play,” Lopez said. The complex will target Class B renters, young professionals, and promote its proximity to Northwest Hospital, Sundt Companies, Afni and shopping. “Tenants might even have time to go home for lunch,” he added.